Barr, who previously served as attorney general from 1991 to 1993, would succeed Attorney General Jeff Sessions, who was pushed out by Trump last year over the president’s anger that he had recused himself from the Russia investigation. As the country’s chief law enforcement officer, Barr would oversee the remaining work in Mueller’s investigation into potential coordination between the Kremlin and the Trump campaign. Acting Attorney General Matthew Whitaker is currently filling the position and said last week that he believed Mueller’s investigation was nearly complete. “I appreciate what Mr. Whitaker has done, but I think the time has come for new leadership at the department,” Sen. Lindsey Graham, a South Carolina Republican and committee chairman, said at the outset of Thursday’s meeting. Barr’s confirmation is expected in the Republican-controlled Senate, though his nomination encountered resistance Thursday from Democrats concerned by Barr’s expansive views of executive authority and by his non-committal stance on making public Mueller’s findings. Democrats and many Republicans have said they believe Mueller’s final report should be fully released. Barr has said he will be as transparent as possible under Justice Department regulations and will make as much public as he can. But he has also noted that he takes seriously department regulations that say the report Mueller submits to the Justice Department should be treated as confidential. 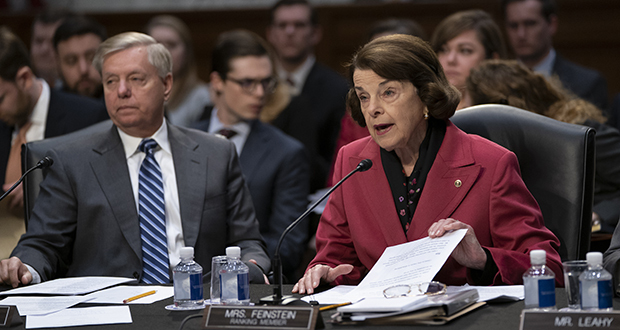 Sen. Dianne Feinstein, the committee’s top Democrat, said she was concerned that Barr won’t commit to releasing Mueller’s report to Congress. Democrats have also criticized a memo Barr wrote to the Justice Department before his nomination in which he criticized Mueller’s investigation for the way it was presumably looking into whether Trump had obstructed justice. In the memo, Barr wrote that Trump could not have obstructed justice by firing former FBI Director James Comey since it was an act the president was constitutionally entitled to take. That view has alarmed Democrats, especially since the obstruction inquiry has been central to Mueller’s overall investigation. Some Democrats have also expressed concern that Barr won’t be a check on the president who appointed him.